It’s hard to know what to cover in this objective as performance tuning often implies troubleshooting (note the recommended reading of Performance Troubleshooting!) hence there’s a significant overlap with the troubleshooting section. Luckily there are plenty of excellent resources in the blogosphere and from VMware so it’s just a case of reading and practicing. Power saving for the CPU. NOTE: You should also enable the ‘No Execute’ memory protection bit. NUMA settings (node interleaving for DL385 for instance. Normally disabled – check Frank Denneman’s post. I guess they mean the HCL. Let’s hope you don’t need an encyclopaedic knowledge of driver version histories! Read this great series of blog posts from Arnim Van Lieshout on memory management – part one, two and three. And as always the Frank Denneman post. 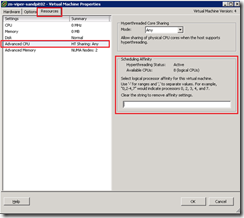 Check your Service Console memory usage using esxtop. Transparent Page Sharing (TPS) – otherwise known as memory dedupe! 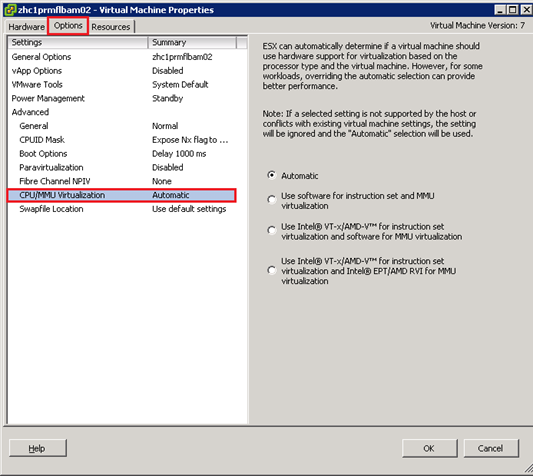 Disable per VM – add sched.mem.pshare.enable = FALSE in .VMX (entry not present by default). Default max for balloon driver to reclaim is 65%. Can be tuned using sched.mem.maxmemctl in .VMX (entry not present by default). Read this blogpost before considering disabling! Stored (by default) in same datastore as VM (as a .vswp file). Size = configured memory – memory reservation. NOTE: While both are classified as ‘memory optimisations’ they both impact storage capacity. Memory compression is a new feature to vSphere 4.1 (which isn’t covered in the lab yet) so I won’t cover it here. Overcommit % shown on the top line of the memory view (press m). 0.19 = 19%. ‘Memory shared’. For VMs and hosts, collection level 2. MEMCTL/MB – check current, target. ‘memory balloon’. For hosts and VMs, collection level 1. ‘memory balloon target’. For VMs only, collection level 2. SWAP/MB – check current, r/s, w/s. 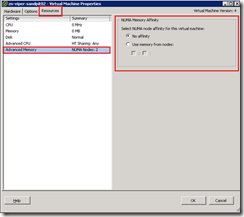 ‘Memory Swap Used’ (hosts) or ‘Swapped’ (VMs). Collection level 2. ‘Swap in rate’, ‘Swap out rate’. For hosts and VMs, collection level 1. 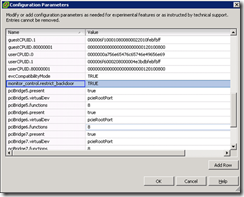 NOTE: Remember you can tailor statistics levels – vCenter Server Settings -> Statistics. Default is all level one metrics kept for one year. Read Duncan Eppings blogpost for some interesting points on using esxtop to monitor ballooning and swapping. See Troubleshooting section 6.46.2 for more information on CPU/memory performance. Network usage average (KB/s). VMs and hosts, collection level 2. See Troubleshooting section 6.3 for more information on networking performance. Set hyperthreading sharing options on a per VM basis (Edit Settings -> Options). Default is to allow sharing with other VMs and shouldn’t be changed unless specific conditions require it (cache thrashing). NOTE: VMware recommend disabling CPU power management in the BIOS if performance concerns outweigh power saving. CPU load average (top line) – for example 0.19 = 19%. %MLMTD – should be zero. 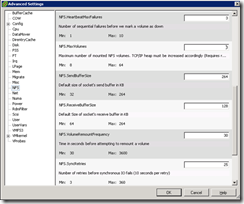 If not check for VM CPU limits. You can also use ‘e’ to expand a specific VM and see the load on each vCPU. Good to check if vSMP is working effectively. 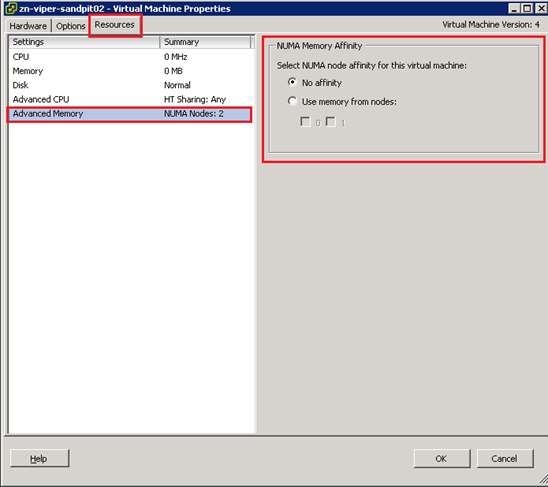 ‘CPU Ready’ – for VMs only, collection level 1. Not a percentage like esxtop – see this blog entry about converting vCenter metrics into something meaningful. See Troubleshooting section 6.2 for more information on CPU/memory performance. In reality there’s not that much tuning you can do at the VMware level to improve storage, most tuning needs to be done at the storage array (reiterated in the ESXTOP Statistics guide).So what can you tune? Watch VMworld 2010 session TA8065 (subscription required). 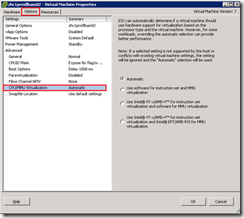 Check multipathing configuration using esxcli and vicfg-mpath. For iSCSI check the software port binding. You should always align storage at array, VMFS, and guest OS level. 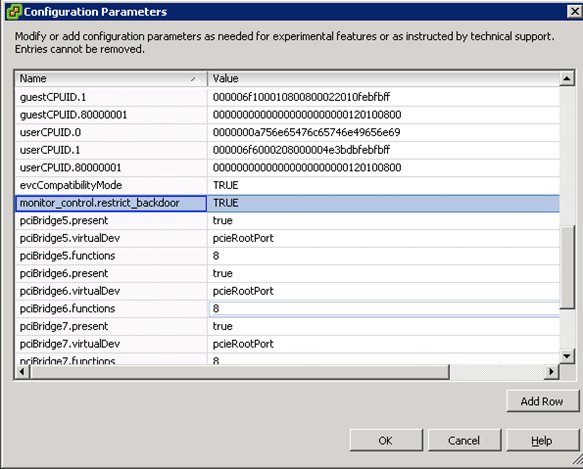 Use esxcfg-module to amend LUN (HBA) queue depth (default 32). Syntax varies per vendor. Use esxcfg-advcfg to amend VMkernel queue depth. Should be the same as the LUN queue depth. See section 3.5 for details of using vscsiStats. NOTE: Prior to vSphere 4.1 (which includes NFS latency in both vCenter charts and esxtop) vscsiStats was the only VMware tool to see NFS performance issues. Use array based tools! CONS/s should be zero (SCSI reservation conflicts. May indicate too many VMs in a LUN). v4.1 only. Disk command aborts – if greater than 1 indicates overloaded storage. V4.1 only. See Troubleshooting section 6.4 for more information on storage performance. Non Uniform Memory access (NUMA) is a technology designed to optimise motherboard design. Rather than provide a single pool of physical memory to the various CPUs each CPU is given a set of ‘local’ memory which is can access very quickly. The disadvantage is that not all memory is instantly accessible to all CPUs. Read VMware vSphere™ : The CPU Scheduler in VMware® ESX™ 4.1 for more info. If you want to understand NUMA, you need to check out Frank Denneman’s site. As of March 2011 he’s got 11 in-depth articles about NUMA. Practical implications for VCAP-DCA exam? Configured per VM. Go to Edit Settings -> Resources tab -> Advanced CPU. Using esxtop go to the memory view (m). The first figure is the total memory per NUMA node (approx. 20GB in the screenshot below) and the figure in brackets is the memory free per node. To get more NUMA related statistics press ‘f’ (to select fields to add) and then ‘g’ for NUMA statistics.